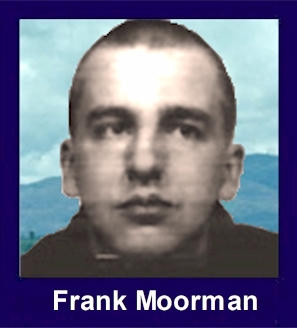 The 35th Infantry Regiment Association salutes our fallen brother, SSG Frank David Moorman, who died in the service of his country on January 23rd, 1969 in Pleiku Province, Vietnam. The cause of death was listed as Medivac Shot Down. At the time of his death Frank was 20 years of age. He was from Clifton, New Jersey. Frank is honored on the Vietnam Veterans Memorial at Panel 34W, Line 66. The decorations earned by SSG Frank David Moorman include: the Combat Infantryman Badge, the Parachute Badge, the Silver Star, the Bronze Star, the Purple Heart, the National Defense Service Medal, the Vietnam Service Medal, the Vietnam Campaign Medal and the Vietnam Cross of Gallantry with Palm Unit Citation. Frank came from a large family of eight girls and three boys. He graduated from high school in 1967 and enlisted in the Army. Frank took basic and advanced training and then went on to jump school for his paratroopers badge. On arrival in Vietnam, Frank was assigned to Company D, 35th Infantry, 4th Division, serving in Pleiku Province. In letters sent home to his Uncle, Frank referred to his unit as "Gypsy Airborne... always being assigned the toughest objectives". On January 23, 1969, according to Army records, PFC Frank David Moorman, having been wounded in action, was placed on a medivac helicopter for transport to a field hospital. As the aircraft lifted off and attempted to leave the area, it was struck by enemy fire, exploded and crashed. Because of the combat situation and the difficult terrain, the helicopter crew and all passengers were not recovered and listed as "Missing in Action". Not until seven years later, in early 1976, did a recovery team uncover the crash site and identify all who where on board the helicopter. During this time, according to Army regulations, Frank was promoted to his final rank of Staff Sergeant. He left behind his mother, eight sisters and two brothers. He was twenty years old.